On June 8, 1968, a young Marine corporal was in the fight of his life with fellow Marines in an operation just south of Da Nang, Vietnam. A half century later he would be awarded the nation’s second highest award for combat bravery for his heroic actions that fateful day. On Saturday, the Commandant of the Marine Corps General Robert B. Neller awarded the Navy Cross posthumously to Cpl. Stephen E. Austin during a reunion held in Alexandria, Virginia, for 1st Battalion, 27th Marines — the unit Austin served as a squad leader with. The award was presented to Austin’s daughter, Neily Esposito. Austin gave his life in Vietnam on June 8, 1968, when he single-handedly took on a bunker firing on his unit. The young corporal convinced his platoon leader not to pull back his unit that was taking heavy fire from a bunker. The platoon leader wanted to withdraw and destroy the bunker with an airstrike. But there was fear that the unit could take heavy casualties if they retreated, the Fresno Bee reported. Austin maneuvered his squad to a point where they could provide cover fire on the bunker. “With complete disregard for his own safety, Corporal Austin single-handedly assaulted the bunker and destroyed it with a grenade,” his award citation reads. Austin was mortally wounded in the attack on the bunker, but his unit prevailed because of his selfless actions. For nearly two weeks leading up to June 8, 1968, Austin’s company with 1/27 had been in the field in an operation dubbed Allen Brook just south of Da Nang. On June 5, 1968, Austin’s unit suffered heavy casualties, 28 wounded and six dead, according to the final letter he wrote home to his parents. The last letter home written by Vietnam Marine Cpl. Stephen Austin to his family. Today, after 50 years, Cpl. 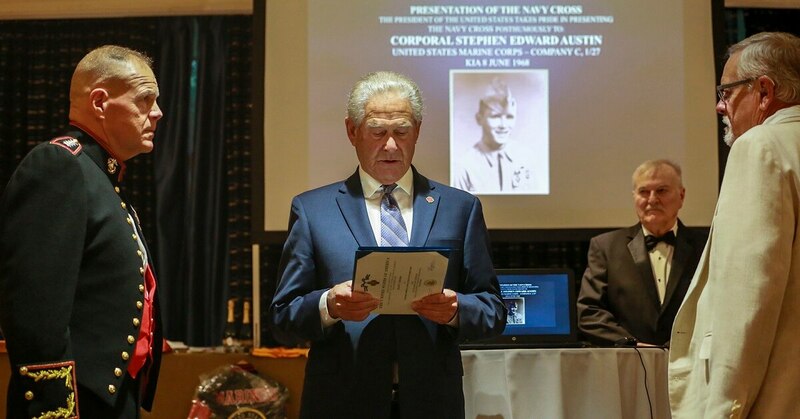 Austin will be awarded the the Navy Cross at the 1st Battalion, 27th Marines Reunion in Alexandria, Virginia. “I am so sick of fighting I’ve seen and helped to[o] many boys my age or younger that was wounded or dead,” Austin wrote in his letter. Friends and some of the men from Austin’s unit pushed an effort to award Austin a citation for his heroic deeds, which took several years to get approved, the Fresno Bee reported. Originally, the men had submitted Austin for the Silver Star but it was upgraded to the Navy Cross, according to the Fresno Bee.